Avengers 4 Post-Credit Scene Already Revealed? No official plot details have even been revealed for Avengers 4 yet, and we're already getting accounts about what will be contained in the post-credit sequence? 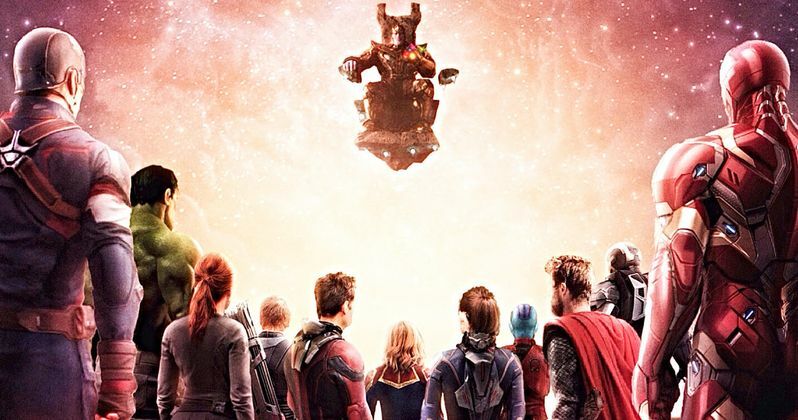 A new rumor claims this final Phase 3 sequel may set up the future of the entire MCU with its final moments. And that it will introduce the new characters known as The Eternals. The Eternals is being planned for Marvel Phase 4, though there hasn't been an official announcement by Marvel and Disney for the sci-fi adventure just yet. The movie does already have a director with Chloe Zhao, best known for The Rider, coming into help flesh out the cosmic side of this universe. The Eternals apparently plays a bigger role in this than previously believed, due to Guardians of the Galaxy Vol. 3 getting sidelined after the firing of James Gunn, who has since moved onto DC and their Suicide Squad sequel. If this pans out, the Avengers 4 post-credit scene will introduce two new characters, both from The Eternals. The Eternals are a fictional human race believed to be the defenders of Earth. The main bad guys are known as The Deviants. Thanos, the big villain in Infinity War and Avengers 4, is an Eternal-Deviant hybrid. So it's easy to see how these characters could play a role in the sequel. Kevin Feige has confirmed that The Eternals movie is definitely happening, but we don't yet know when it will begin production, or when it will arrive in theaters. There have been some murmurs that the movie will begin shooting in 2019. Daniel RPK of SuperBroMovies has revealed that Marvel is currently casting for these two characters, which will be Karen and Piper. He says this about the roles. "They started looking to cast the roles of two of the Eternals RIGHT NOW. And there's a separate breakdown out just for the two of them. What this could mean is they may have a cameo or - most likely - they show up in a post credits scene somewhere for an upcoming MCU film. The two Eternals are 'Karen' and Piper/Sprite. They will most likely show up in a cosmic Marvel movie so either Captain Marvel or Avengers 4. A4 is more likely." Neither Marvel nor Disney have confirmed that this casting is in the process of happening, and we already know that Avengers 4 has wrapped reshoots. The post-credit scenes are often shot away from principle production. The original Shawarma scene in the first Avengers wasn't shot until after the movie had its world premiere. So, will The Eternals be showing up at the tail end of Avengers 4? We could hear about additional shooting soon if this pans out. Fans are anxiously awaiting not only the first teaser trailer for Avengers 4, but also the official title. A prelude comic will arrive in early December. Could the first footage be far behind? They started looking to cast the roles of two of the Eternals RIGHT NOW. And there's a separate breakdown out just for the two of them. What this could mean is they may have a cameo or - most likely - they show up in a post credits scene somewhere for an upcoming MCU film.